return to home | want an elf name? is the journey of the Divine. The mystic seeks direct communion with the Spirit, rather than philosophising, as the Wyzard may do or learning from experience as the Enchantress does the mystic seeks to know intuitively. The Elfin Mystic is in touch with the heartbeat of the spiritual planes, receives direct knowledge from the unseen realms by way of their intuitive mind. This is possible because of the advanced nature of their inner being which is focused continually on otherworldly rather than mundane concerns. The Elfin Mysitic lives in the world yet is not of the world. They literally live between the worlds, physically in one but mentally, intuitively, emotionally and perceptually in that more subtle plane which is the heart of Elfin manifest on Earth. It is true that these beings often seem "out of it", are not in tune with nor aware of much that goes on in the mundane realm. They have a difficult time finding or holding jobs and have little interest in the daily concerns and pleasures that most folk find thems'elves involved in. The mystic even seems distracted, as though listening to music or voices that no one else can hear, which is indeed the case. They are often regarded as "crazy" among the normal folk, but then nearly all the Elven are also so regarded. There is surely no particular function that we could ascribe to the mystics... They have no exact "job description" so to speak, except to listen, to stay in tune and occasionally to wander and thus lead us in their haphazard way deeper into Elfin. That the Elfin Mystic often sems "stoned" is no accident. For quite often their attunement to the nether regions is aided by the assistance of the plant kingdom. Many spiritual disciplines would frown upon the use of "intoxicants" or psychedelics to aid or heighten our relationship with the netherwords but the elfin have no such prohibitions. As long as the intoxicants are not harmful or addictive to ones'elf or others we see no problem with whatever means one choses to contact the Divine. 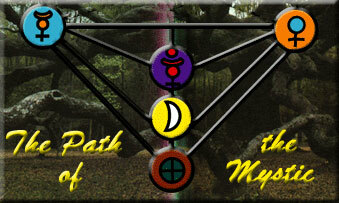 But the heart of the magic of the elfin mystic is in their devotion to their relationship with the netherrealms. Many folk use intoxicants but very few are mystics. It is not the intoxicant that creates the mystic but the Elfin Mystic's reaching out toward the Divine that makes the intoxicant useful as a device for heightening that contact when used with wisdom and discretion. The Challenge: the question is? Can you pass through the world? Can you function well enough that they don't think you're totally loony and lock you up? Can you maintain? The question for the Elfin Mystic is not so much are you in connection with Faerie, for to aspire to be an Elfin Mystic indicates that one is already at least to a degree, so connected. Rather, the question is can you maintain such contact without utterly losing touch with the world? Why not, some might ask... and the reason is multifold. One, you are unlikely to find the results of this favorable, although surely it is possible to be so gone that you hardly notice. But more importantly, you do no good for the rest of us. We are a team remember? We are here on a mission... a mission of love and service... a bit of magic to heal the rift between the worlds and allow Elfin to awaken in the world. Are you ready for that? The Magical Act: what to do. Tune in to your inner being, turn on the Voices of Faerie and drop out of the enculturated rat race that attempts to keep us forever trapped in a maze of neverending things to do. Walk in the beauty and majesty of Elfin, every once and a while mutter something esoteric that we will attempt to decipher. There are four paths that lead from here. You are always in tune with the Divine. What do you wish to do now? Are you seeking to connect to and understand the true sources of power and energy in the universe? Are you willing to empty yourself and allow the universe to communicate through you? Do you endeavor to connect to the universal energy to affect and realize the etheric planes of being? Do you desire to tune into the energy of the universe in order to manifest real things on the material plane?